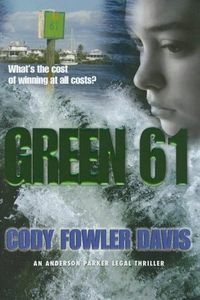 Green 61 by Cody Fowler Davis, a Mysterious Review. Review: Rules are for losers sums up the approach the defense attorney takes in Green 61, Cody Fowler Davis' often riveting debut legal thriller with plaintiff attorney Anderson Parker. The title refers to a marker in the Intracoastal Waterway outside Tampa, the site of a tragic accident that is central to the plot of the book. The case being decided in Green 61 is deceptively simple yet intriguing. No party is completely blameless, and the trial is a balancing act between what is morally right and what is legally right. Somewhat surprisingly, the book devotes more time to Parker's former employer and opponent in the case, Justin Cartwright. And while Parker seems to be going through the motions in preparing his case, Cartwright is actively and aggressively defending his client. Despite some uneven passages and far too many irrelevant descriptive details in the early chapters, Green 61 is a compelling legal thriller and is recommended. Acknowledgment: Author Marketing Experts provided an ARC of Green 61 for this review.